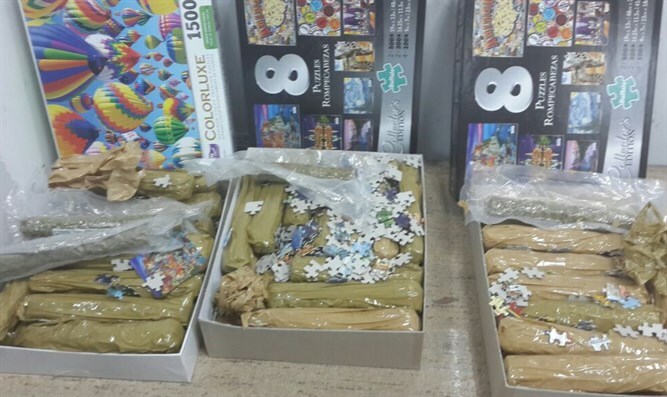 500,000 shekels worth of marijuana found concealed in children's puzzle sets. Police arrested a 25-year old resident of Jerusalem suspected of importing banned drugs into Israel for the purpose of narcotics dealing. On Tuesday, the suspect was brought before a district court on charges of drug possession with intent to sell. The investigation began nearly two weeks ago, following the discovery by customs officials at Ben Gurion Airport of drugs concealed inside the boxes of children’s puzzles being imported into Israel. Authorities were surprised to find bags of cannabis hidden amongst the puzzle pieces, with a total of five kilos found in total. The street value of the cannabis, say police, is roughly half a million shekels ($138,970). Police suspect the man who imported the drug shipment arranged for a courier service to place the package containing the drugs in a locked postal box in central Jerusalem. After the discovery of the hidden cannabis, authorities tracked down the intended recipient of the shipment and took him into custody.